Home Scandal and Gossip Texas two year old toddler abandoned on stranger’s doorstep. Texas two year old toddler abandoned on stranger’s doorstep. Pictured, Texas two year old toddler, Royal Prince Simmons and the woman who dropped him off outside the doorstep of a Spring, Texas house. Pictured, two year old toddler, Royal Prince Simmons and the woman who dropped him off outside the doorstep of a Spring, Texas house. Royal Prince Simmons two year old toddler abandoned at Spring, Texas home by mother’s friend cause she thought it was the father’s house. But who just drops babies in the dead of night anyway? Video footage has revealed a woman in Texas abandoning a two year old toddler on a stranger’s doorstep. The incident taking place on Wednesday, October 17 just on 8.20pm- outside a home in Spring, Texas. Captured footage showed the woman, leading the boy- identified as Royal Prince Simmons as she dragged him along the drive. In her free hand- the woman was holding a monkey shaped backpack- presumably her son’s ‘to-go’ belongings. Reports revealed the woman in the video as a friend of the child’s mother, who was in the hospital. ABC reported the child’s father living next door to the house where he’d been dropped him off. Not immediately clear is whether the woman had believed herself to be dropping off the boy at the father’s home, and had simply confused the home. Royal Prince Simmons: dropped off in the middle of no-where. As the incident begins, video shows the woman quickly approaching the door and dumping the boy and his ‘to-go’ belongings by the door. The woman then rings the doorbell, knocks on the door and runs away- leaving the two year old boy standing clueless and unawares. Video shows the woman getting back into the white vehicle she filmed arriving and driving away. When the homeowner answered, the little boy was staring blankly at her with his belongings by his side. The woman took him inside and called police who then reviewed her surveillance camera footage. The father approached by media the morning after the incident- recognized the child as his own and called authorities. ‘What if my neighbor wasn’t there? 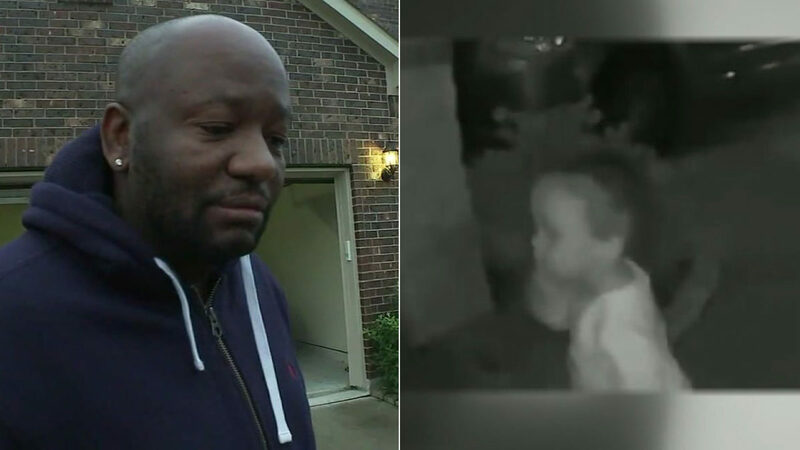 If my neighbor wasn’t there, my son would have been roaming up and down the street,’ the child’s father, Willie Simmons told KTRK-TV. ‘That was very irresponsible. And I feel the lady who dropped my son off needs to be held accountable,’ said Simmons. Which is to wonder why didn’t the ‘friend’ simply ask to speak to the father if that is who she believed herself to be dropping the boy off for? Why the clandestine dropping off the child in the middle of the night- without necessarily knowing if there was anyone on the other side of the door? 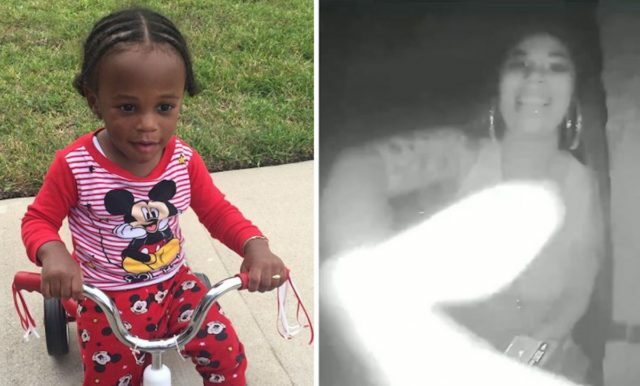 The woman seen in the video has since been charged with child abandonment, with the Montgomery County Sheriff’s Office declining to release her name. Pictured, Royal Prince Simmons and the boy’s father, Willie Simmons. Royal Prince Simmons: In the hands of disorganized, uncaring adults? In a plot twist, KPRC reported the father saying he had gotten a text from his son’s mom the day before. The text said one of her friend’s would drop the boy off at his home on Monday afternoon. That never happened, with the father assuming plans had changed, with the man leaving the neighborhood. It was only later did Simmons discover that the woman in the viral video was in fact the friend his son’s mother had been referring to. In its report- the dailymail lists the street where the boy was left as being full of large family homes worth an average of $275,000. There are parks, tennis courts and schools nearby, and many of the houses have large backyards with their own pools. Pictured, Royal Prince Simmons’s mother’s friend. Why didn’t she simply ask to speak to the father if that is who she believed herself to be dropping the boy off for?